DAY 1: CUSCO / CANCHA CANCHA COMMUNITY . 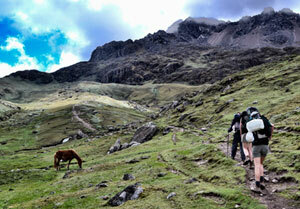 We leave Cusco by bus, on the way down to Pisaq in Huaran stream (2950 m/9676 ft). Here we begin to walk up a small valley that tapers gradually upwards, while an original Inca Trail, enjoying a variety of flora and fauna. 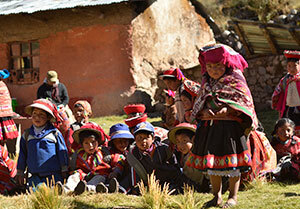 After a few hours of walking, we arrived at Cancha cancha Comummnity (4000 m / 13.192 ft), where you will be greeted and have the opportunity to share a glimpse of the traditional lifestyle and culture of this Andean community. DAY 2: Cancha Cancha / Quiswarani. (Time: 6 hours / Distance: 9 km). After breakfast we ascend slowly to Accopata, an extension of Cancha Cancha community where shepherds live in chozas (humble houses ) made of stone and roofs typical Ichu (tussock grass). We will continue walking through Collaycocha Chacon Mountains , reaching a waterfall near the Community Quiswarani (3902 m / 12,798 ft), where the camp to enjoy the scenery and the traditional lifestyle . DAY 3: Quiswarani / CUNCANI. After have breakfast, we left our camp to start to climb the Huillquijasa pass (4,457 m / 14,618 ft) and see the Colque Cross and glaciers also lakes filled with geese (Andean geese), ducks. The highest point of this day is at (3886 m/12746 ft) down until we reach the community of Cuncani, a pictures que village, similar to the previous site. This was the last refuge of the Royal Panaka, a sect Inca. In the afternoon we will continue on the path along high lands, lakes and agricultural areas until reaching Cuncani 3 hours later, where we will have dinner and camp. We left at 8:00 a.m. Cuncani to walk through a fertile valley with lush vegetation, crops and agricultural communities. Along the trail we will see native flowers such as begonias and wild orchids. 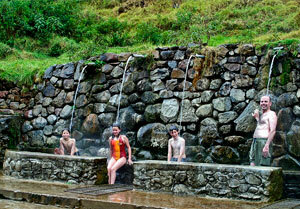 After a walk of about two hours we arrive in Lares (3261 m / 10,696 ft), capital of the district of the same name, a large village whose principal attraction is its hot springs where we can enjoy a swim. After lunch, we will board a private car to take us to Ollantaytambo. From here we continue three more hours by car to Ollantaytambo to continue extending the trip to visit Machupicchu taking the train to Aguas Calientes. We spend the night in the hotel.